Father-Daughter Dance: Eric Bamberger and his daughter Ali have a rule when it comes to breaking down her basketball games. Ali, 16, is the star junior post for Carondelet-Concord. And on this night, March 2 at Saint Mary’s College, daughter gave dad a reason to gush. 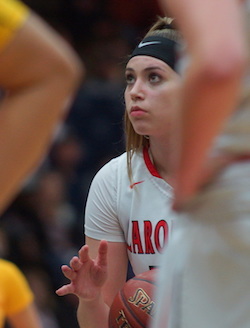 She scored 28 points, grabbed eight rebounds and added four blocks and four assists in a 71-58 win over Heritage that clinched the Cougars’ 13th North Coast Section crown in 16 years. And yet it’s entirely possible that by the time both got home, Ali was likely eager to give her dad all the time he wanted — to talk boys basketball. 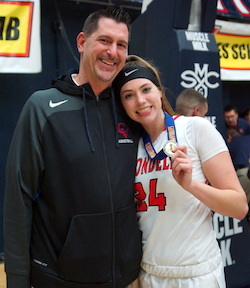 Because on a unique night in which dad and daughter both competed for NCS Division I section titles, in back-to-back games at the same venue, it was only Ali who came home with a medal after Clayton Valley fell to Heritage 71-66. Ali Bamberger eyes a free throw during the NCS Division I final on March 2. And despite the night ending in mixed results, the Bamberger Family had no intention of taking the night for granted. 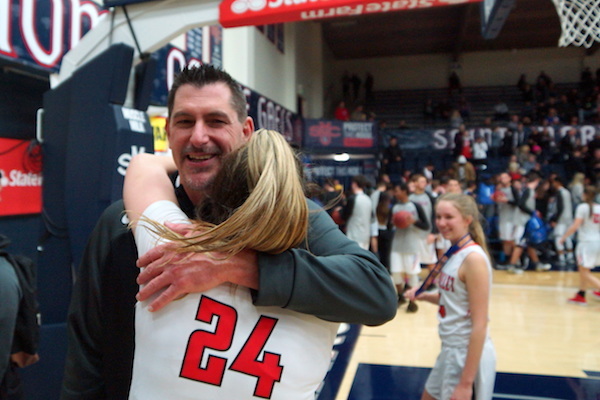 It was a culmination of what’s been a special year for both dad and daughter — a year in which the two may have shared more through basketball, despite seeing less of each other’s games than previous seasons. And both have been able to take an immense amount of pride in one another. “Everyone who has a dad that’s a coach always really likes to say ‘Oh my dad is an incredible coach,’” Ali said after her team’s championship victory. “I feel like up until this year, no one has really seen how great of a coach my dad really is. 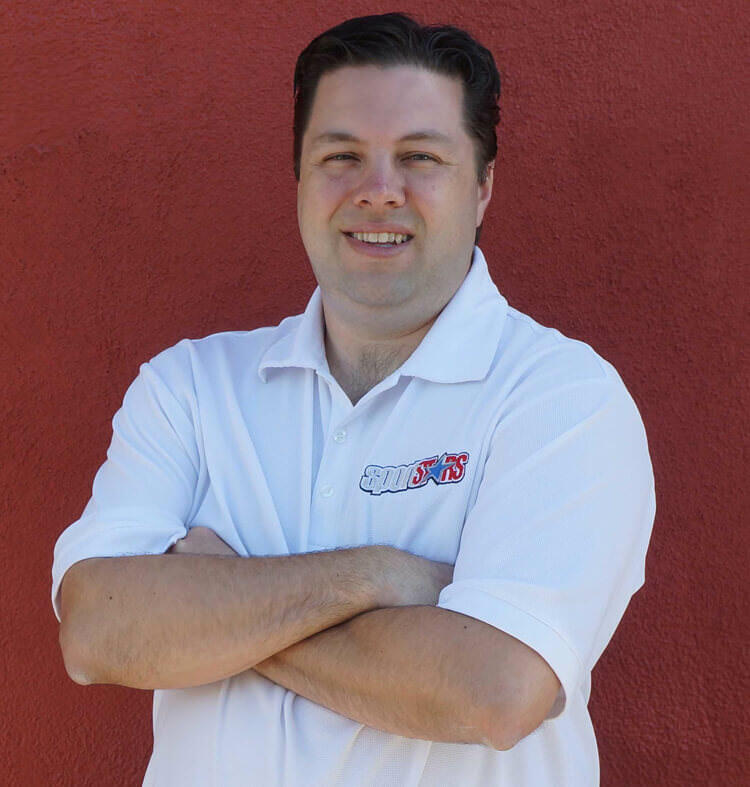 Despite the loss in the final, the older Bamberger has led Clayton Valley to a landmark season that’s included a Diablo Athletic League-Foothill title and a 26-3 overall record heading into the CIF Div. I Northern Regional playoffs where they earned a No. 4 seed and host Menlo School-Atherton at 7 p.m. on March 7. It was the program’s first trip to an NCS final in 14 seasons. 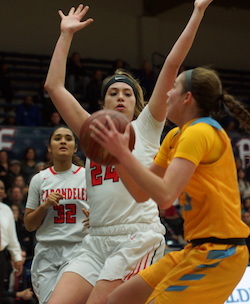 Meanwhile, Carondelet (22-8) has been a consensus Top 8 team in NorCal throughout the season. The Cougars drew the No. 6 seed in the Open Division regional and travel to No. 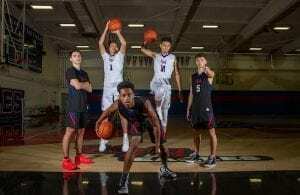 3 Pinewood-Los Altos Hills for a 7 p.m. tipoff on March 9. Ali has been their go-to star. Eric stands with Ali prior to coaching Clayton Valley in the NCS Division I boys final on March 2. She’s also her mom’s first choice on game nights. During the NCS final, one of Ali’s few games in the last month or so Eric has been able to watch, he only managed to stay in his seat for the first five or so minutes of the game. Not coincidentally, things weren’t going well for the Cougars during a first quarter in which they had nearly as many turnovers (7) as points (8). 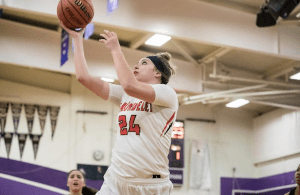 But Carondelet settled down and Ali poured in 13 points in the second quarter to help lead a comeback from a 10-point deficit. The Cougars would lead 28-27 at halftime, 48-41 after the third quarter, and never trailed in the fourth. Bamberger finished the NCS final with 28 points, eight rebounds, four assists and four blocks. She said this as the Clayton Valley boys warmed up for their final in the background. As she watched, she admitted her nerves were growing for her dad and his team. Watching the boys final probably didn’t help Ali or the rest of the family’s nerves. Clayton Valley and Heritage played neck-and-neck throughout. Heritage had one point leads after the first quarter and at halftime. It was tied 52-52 after three quarters, and the fourth quarter featured three lead changes and three ties before the Ugly Eagles went scoreless in the final two minutes. As for Eric, a hug from Ali probably went a long way in soothing the defeat.